1. To make sauce: Coat a large nonstick pan with cooking spray. Heat olive oil in pan over medium-high heat. Add onions, yellow peppers and mushrooms and cook about 4-5 minutes, until soft. Stir often. Add garlic, tomato paste, red pepper flakes and cook for 1 minute. Stir in tomatoes, vinegar, Italian seasonings and sugar. Cook until slightly thickened, about 3-5 minutes. Stir often. Reduce to low heat to keep warm. 2. To make steak: Coat a large nonstick pan with cooking spray. Add steaks and sprinkle with Worcestershire sauce. Top with a little pepper. Brown steak on both sides for about 5 minutes for medium-rare. Cook a little longer, if desired. Remove from pan and transfer to cutting board. Let rest for 5 minutes before slicing into strips. 3. 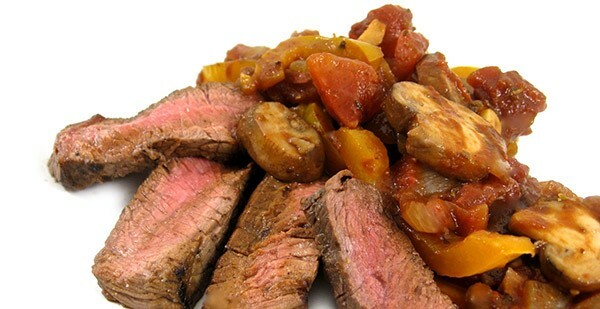 To serve: Divide steak slices among 4 plates. Top each with about 1 cup sauce or serve sauce on the side.